Babyologists I believe I’ve found the holy grail of all things magnificent and wooden. If you love classic wooden toys I suggest you warm up your shopping trolley wheels for this utopia of enchanting French toys. My first glimpse of this wooden shape sorter truck (pictured above) was love at first sight. I imagine little hands will love to get hold of it, ferrying and sorting the superb coloured discs on and off. Let it be said classic or wooden need never mean boring or dull where Janod is concerned. It’s with no word of a lie when I say I love it all. 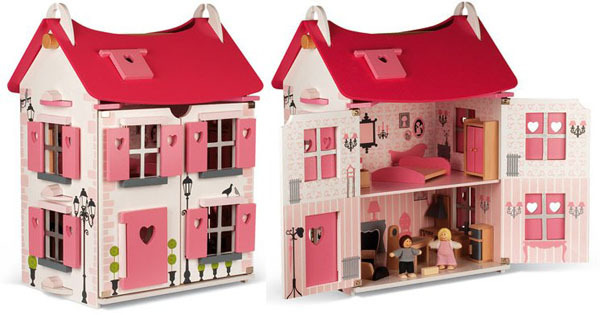 This French company has everyone covered – babies will be entertained with gorgeous rattles, toddlers can move to their own beat with easy on the eye musical instruments and there’s plenty of imaginative play options for young children, such as the exquisite French Maison doll house. If your child is enthusiastic about puzzles, Janod have fantastic options. The magnetic wooden toy helicopter is a bright, beautiful toy that comes apart as a puzzle and once joined, can be played with endlessly. 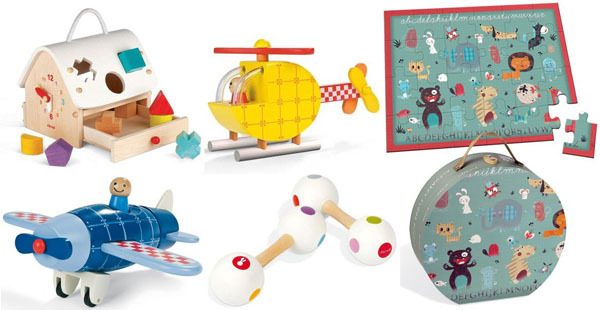 A magnetic wooden rocket and plane are also available and make a gorgeous trio. The Alphabet floor puzzle will also please and is presented in a charming hat box. Janod toys are priced from $29.95 at local stockists Urban Baby.